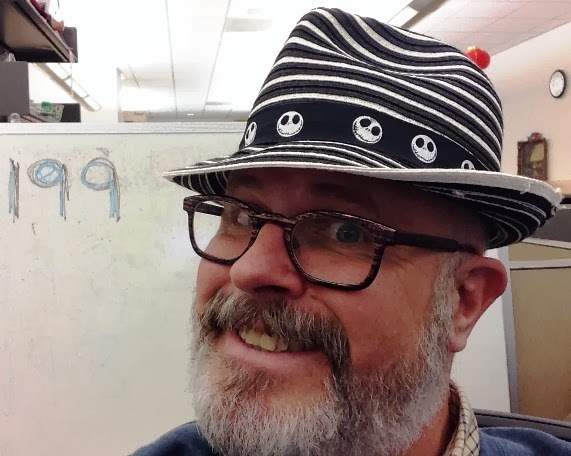 Day 199 / Hat 199: Black-and-white-striped woven fedora with black grosgrain hatband screen-printed with the smiling visage of Jack Skellington from "Tim Burton's The Nightmare Before Christmas." Interior tags read: Disney Parks, Authentic, Original" and "100% straw, Made in China." Another loan to the Project from the magical millinery holdings of Team Boucher, I'm not sure what amazes me more: the fact that is is just one of several available options for an authentic Jack Skellington themed fedora (go ahead, search the interwebs, we'll wait) or the fact that the movie came out twenty years and two months ago. Oh, and if anyone happens to own one of these Goorin Brothers Walter White Heisenberg pork pie hats, I'd love to borrow it for the Project. So today's hat-tip goes to Team Boucher who just keeps bringin' it!